UH News ReleaseThe Society of Exploration Geophysicists (SEG) recognized the brightest stars in geophysics during the 2016 Honors and Awards Ceremony at the 86th Annual Meeting. 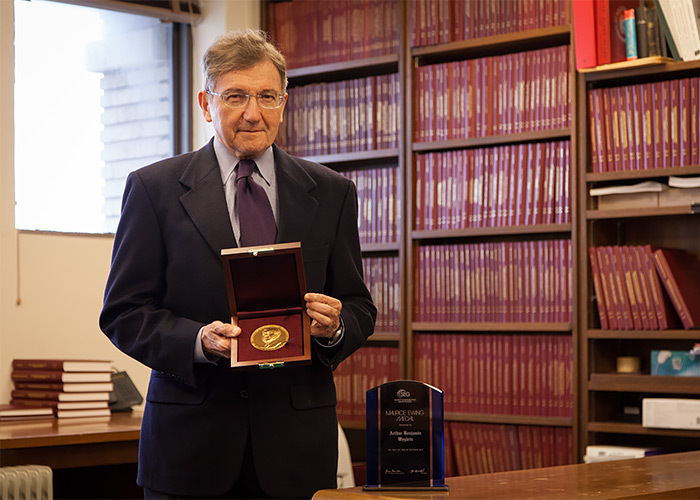 This year, SEG bestowed its highest honor, the Maurice Ewing Medal, upon Arthur B. Weglein, who holds the Hugh Roy and Lillie Cranz Distinguished University Chair in Physics at the University of Houston where he is a professor in the Department of Physics and the Department of Earth and Atmospheric Sciences. 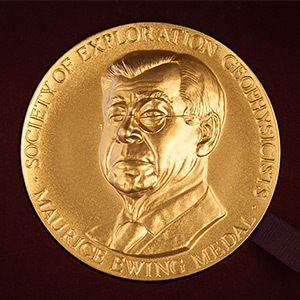 Established in 1978, as the highest honor bestowed by SEG, the Maurice Ewing Medal is awarded to a person who, in the unanimous opinion of the SEG Honors and Award’s Committee and of the SEG Board of Directors, is deserving of special recognition through having made major contributions to the advancement of the science and profession of exploration geophysics. The Maurice Ewing Medal also confers Honorary Membership on its recipient. In 2010, Weglein received SEG’s Reginald Fessenden Award, which is given annually to a person who has made a specific technical contribution to exploration geophysics, such as an invention or a theoretical or conceptual advancement. Since his receipt of the 2010 Fessenden Award, Weglein’s work on the inverse scattering series (ISS) has made the leap from conceptual advancement to an accepted practical solution, not only for multiple removal but also for other components of the seismic processing chain, such as wavelet analysis and depth imaging, particularly in complex geological environments. This broad application has elevated Weglein’s ISS work to a major contribution to the science of exploration geophysics. In addition to these technical achievements, Weglein has done a great job in writing and teaching for the seismic industry. He has written many papers for GEOPHYSICS and The Leading Edge, and has coauthored books on multiple attenuation (with Bill Dragoset) and seismic imaging and inversion (with Bob Stolt). His mentorship of graduate students has led to five of his students receiving the J. Clarence Karcher Award. In service, Weglein has served as the 2003 SEG Distinguished Lecturer and has served on the SEG Council as a district representative.